This photograph is a depiction of the combination of old and new parts. 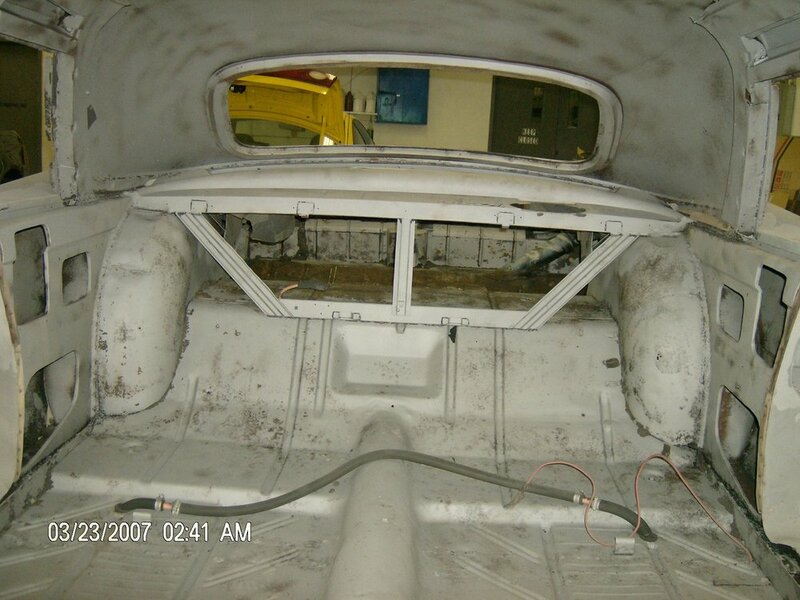 The center section just below the horizontal bracing is modeled from a ‘55 - ’56 factory built limousine. This floor section joins the front stock floor board with the rear stock floor board. It supplies not only the floor stretch but also mounting holes and depressions for jump seats. The skill of the Ghia metal workers is demonstrated here by the factory appearance of the stretch and the existence of the tapered transmission tunnel. The Chrysler built limousine had a semi-flat floor in the rear compartment. However, it used identical jump seats. The inboard mounts of these jump seats had been modified to accommodate the transmission tunnel which was part of the new design of the car to make it much lower to the ground. It appears this stretch panel is wholly Ghia produced. Everything you see in the photograph with the exception of the floor pan is handmade and the wheel wells have been modified. The previously mentioned quarter reinforcements, package shelf, bracing, the entire roof section, and window openings are all Italian made. Stock '57 four door fin termination in the middle of the rear door. 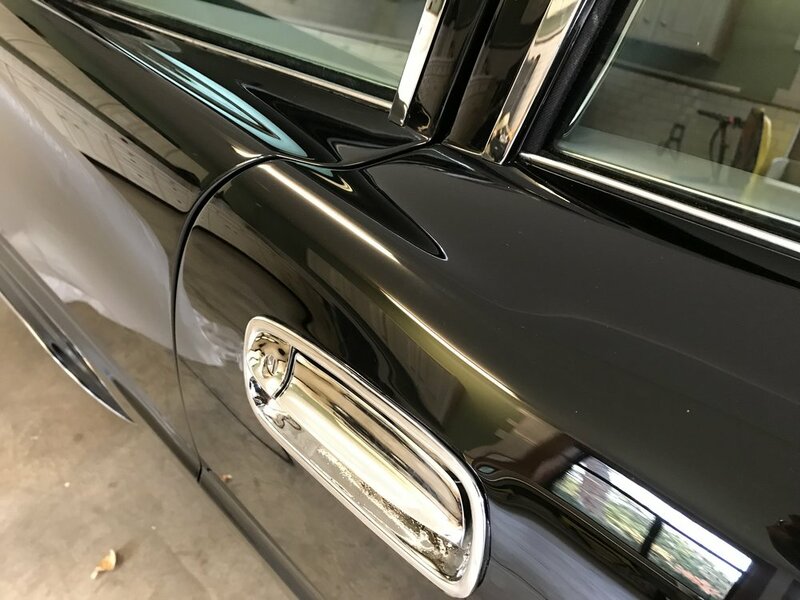 Ghia only fin termination at and around the rear door handle. 1955-56 limo showing the semi-flat floor. As you can see, the floors from the ’55/’56 Chrysler built limousines have completely different stamping characteristics. However, the wells for the jump seats are near identical. 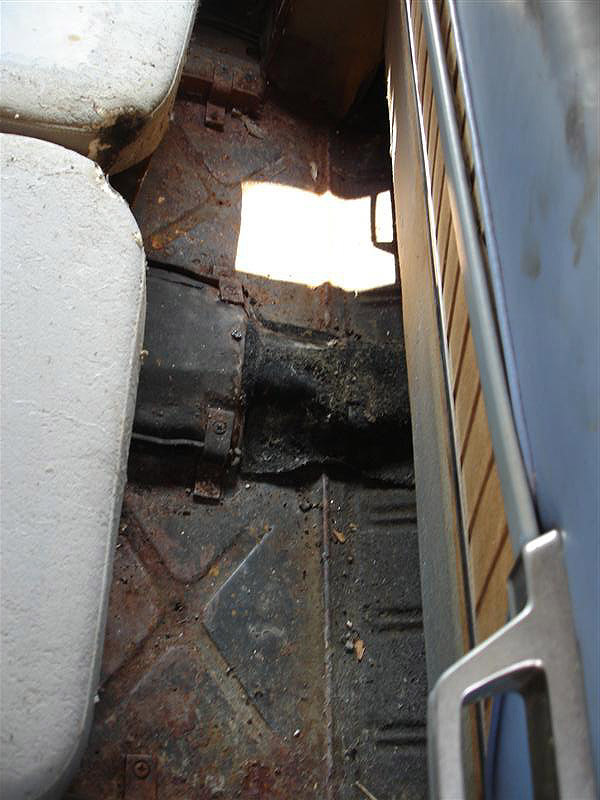 Evidence of the roof panel and other structural pieces, undoubtedly manufactured by Ghia, having the same incredibly well finished appearance, leads me to believe even this floor section, which is detailed with 1957 Chrysler diagonal stamping reinforcements was built by Ghia. This is a front frame horn that mounts the bumper. All ’57, ’58, ’59 Ghias were produced by Chrysler in 1957. This shows the front frame horn modification so the 1958 bumper could be mounted on the ’57 car. 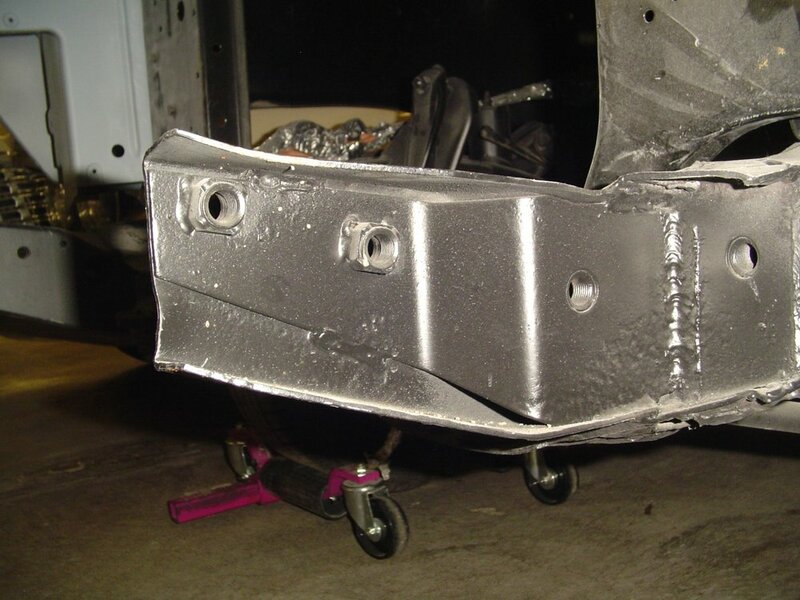 The two front holes mount the 1958 bumper, the rear holes mounted the 1957 bumper and the entire front of the frame horn has been highly modified. Modified '57 frame horn on my '58 Ghia. This being a 1958, the grill was standard. In 1957, the biplane bumper had a 1958 grill added to it. This car was supplied to the Ghia factory with a 1957 bumper. So this 1958 bumper was shipped and applied to the car. As usual, the conversion to Ghia specs was very labor intensive but purposely visually understated. The Imperial emblem is the stock unit. The CROWN letters were Ghia only. They actually had about a 10º angle cut into the base of them which make the letter face slightly upwards. They’re gold plated and attached to the vehicle with tiny silver soldered studs.